Thursday, 19 June 1862, p. 5. Thursday, 19 June 1862, page 5. PRESENTATION TO CAPT. NORMAN, OF THE VICTORIA. An address from the Exploration Committee of the Royal Society was yesterday presented to Captain Norman, on board H.M. c.s.s. Victoria, to testify the Committee's admiration of the zealous and skilful way in which the naval expedition despatched to the Gulf of Carpentaria with the object of rendering relief to the missing portion of the Victorian exploration party, under the leadership of Mr Burke, was carried out. 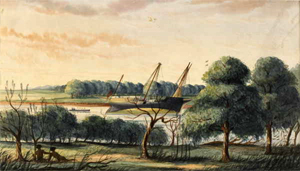 A deputation from the committee, consisting of the Honorary Secretary, Dr Macadam; Dr Eades, Mr Selwyn, Mr S Elliott, Dr Iffla, Mr James Smith, Mr Gillbee, Captain Cadell, &c, left Melbourne by the quarter to twelve am train to Sandridge, and proceeded from thence by steamer to Williamstown, where two of the boats of the Victoria were awaiting their arrival to convey them on board the man-of-war. Exploration Committee of the Royal Society of Victoria. of Her Majesty's colonial steamer Victoria. The members of the Exploration Committee of the Royal Society of Victoria desire to convey to Commander Norman and the officers and men of H.M.C.S. Victoria, the very high sense they entertain of the admirable manner in which the arduous and important duties devolving on them have been fulfilled in the late naval expedition to the Gulf of Carpentaria, for the purpose of rendering relief, if possible, to the missing portion of the Victorian Exploring Expedition, under the leadership of Robert O'Hara Burke. The success and safety of the expedition depended on the courage, energy, skill, and foresight of its commander, and vigilance, zeal, and alacrity on the part of those associated with him in this honourable enterprise. On a comparatively unknown coast in a comparatively unknown sea, and at the most unfavourable season of the year in a tropical climate, the Victoria was called upon to fulfil a mission of humanity. Emergencies had to be met with promptitude and decision, and hardships and dangers had to be encountered with that cheerfulness and courage which are the characteristics of the British sailor. All this was perfectly accomplished, and although the members of the committee are aware that to those who have the honour of wearing Her Majesty's naval uniform, the consciousness of having performed their duty nobly and well, is the recompense they chiefly prize, yet the members of the committee are anxious to testify, in this permanent form, the extreme satisfaction they have experienced, and the warm gratitude they feel to the commander, officers, and men of the Victoria, for the exemplary manner in which they have executed the humane and onerous task confided to them. In conclusion, the members of the committee feel called upon to eulogise the highly judicious direction given by Commander Norman to the two contingent land parties organised and despatched from Brisbane and Rockhampton, and, further, to thank him for the valuable journals and charts contributed by him to geographical knowledge. Per pro Wm F Stawell, President. Dr Macadam then handed the address to the gallant commander, amidst applause. Gentlemen, on behalf of myself, the officers, petty officers, and crew of this vessel, I accept with much pleasure this mark of your respect, which you now present to us in this hand- some manner, for having performed our duty in the late expedition to render immediate relief (if possible) to the late missing explorers; which being a duty of humanity, I felt from the beginning of the expedition to be the noblest service that I had been called upon by the Government lo perform during the seven years I have had the honour to command this vessel. By the unfortunate wreck of the Firefly, our labours were very greatly increased; but this difficulty I was enabled to overcome by the exertions of my officers and crew, and (as you are already aware by my journal) to reach our appointed place of rendezvous without further accident, with only the loss of the time occupied in saving the remnant of the wreck and patching her up sufficiently to take the remainder of the horses on board of her. For the navigation of that but little known part of the world which we were compelled to pass through in the performance of our duty, it is only necessary for me to state that a good look-out and ready action at all times are indispensable to pass safely through the many dangers already known to exist; but as no doubt there are many which have escaped the vigilance of the able marine surveyors, whose duty it has been to survey the Coral seas, and may also exist in the Gulf of Carpentaria itself, it was necessary that every possible precaution should be taken by me for the safety of all on board; and in this I was ably assisted by my officers in their respective stations. From the first receipt of my instructions to prepare for the expedition, I knew it was necessary to make every arrangement and provision for emergencies before leaving here. In doing so, as nothing was to be obtained after leaving Brisbane, I provided everything accordingly that, in my judgement, was requisite for performing the duty in a proper manner; and I shall ever feel proud that, by having done my utmost to carry out the spirit of my instructions, I have merited this token of esteem from your committee. The gallant captain added a few words eulogistic of the assistance and co-operation which he had received in the expedition, from both his officers and men, without which he felt that his own efforts would have been powerless. This concluded the formal proceedings connected with the presentation. The deputation were afterwards shown over the ship by Captain Norman and the officers, and were entertained in the cabin by the captain. The health of the commander, proposed by Dr Macadam, was drunk with enthusiasm. Captain Norman, in responding, expressed his readiness to render any services for the benefit of the colony which it might be in his power to do. The health of the officers, coupled with the name of Lieutenant Woods, was also toasted. The deputation shortly afterwards took their departure, but before doing so, they gave, on behalf of the Exploration Committee, £10 for the crew of the ship. Two water-colour drawings, one representing 'The Victoria Naval Depot, Albert River, Gulf of Carpentaria,' and the other 'The Victoria Naval Depot, Investigation Roads, Gulf of Carpentaria,' which were sketched by the first lieutenant, Mr Woods, during the expedition, were presented by that gentleman to Dr Macadam, for the Exploration Committee. The pictures presented to the Royal Society of Victoria were donated to the State Library of Victoria in 1984. Drawing : watercolour on buff paper ; 25.0 x 44.3 cm on mount 39.9 x 61.2 cm. Signed on original mount (retained) below image l.r. : GA Woods / Lieutenant R.N. Gift of The Royal Society of Victoria 1984. Go to the record of this image at the State Library of Victoria. Drawing: watercolour on buff paper; 25.4 x 43.6 cm on mount 39.9 x 61.2 cm.